Green Dan, LLC announces sales of the book titled Green Dan Says! ‘Renewable Energy is Cool’ for iPads and iPhones is nothing short of incredible with sales doubling and tripling as months pass. Author Dan Marsh, aka Green Dan is dedicated to educating children on renewable energy and energy conservation with the first book being a simple, easy to read, colorful introduction to renewable energy. The Green Dan series is perfect for elementary school teachers. 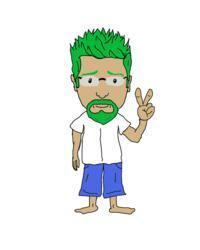 Green Dan, LLC announces sales of the book titled Green Dan Says! ‘Renewable Energy is Cool’ for iPads and iPhones is nothing short of incredible with sales doubling and tripling as months pass. Author Dan Marsh, aka Green Dan is dedicated to educating children on renewable energy and energy conservation with the first book being a simple, easy to read, colorful introduction to renewable energy. The Green Dan series is perfect for elementary school teachers! Dan Marsh, renewable energy advocate, inventor, children’s educator and author practices what he preaches too! Dan’s comments on this was the fact he was shocked on how many people teach solar classes, and run around talking about how great renewable energy technologies are but don’t utilize any of it on their own homes. Dan is proud of the fact his home has a 1kW vertical axis wind turbine, more than 3,800 watts of thin-film PV, (grid-tied w/ battery back up) solar hot water for home heating, solar hot water for domestic uses and an experimental ground source heat pump. When you get there, click on ‘News’ to see what’s been going on.